Our designers concerned with the graphic style and image to convey a deep meaning to your target audience. We make sure to deliver a unique logo design which adds a dimension to the best user experience and to the whole identity. After All, we are working to provide a unique identity to your business. Our clients are the key to our success. We always look forward to working closely with your ideas by allowing you to express your likes and dislikes until you get the final outcome for your logo designs We make sure that our client gets exactly what they want by delivering the best result which exceeds their expectation. "Logo designing was very good. It was appealing. They gave me various options so that I can choose the best. The concept which I wanted was done"
"It was great working with verve logic team. They have very well understood our concept and designed the logo as per our requirement. Team, keep the good work going." 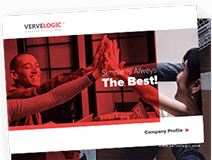 "Work done by team verve logic is amazing and i am very much impressed like before i have tried other service providers for the same as a last try i thought of going with verve logic and they have given me amazing logo for the company. They understand the client needs and also what they are looking for and they just don't work exactly with your idea but much more than that putting their ideas too making it more good. The work given by verve logic made me not to think other than verve logic. When i think about other logo design my destination would be verve logic. Thank you so much for giving me such an amazing logo." "It was a very pleasant experience with Verve Logic. They provided on the very first concept itself a logo based exactly on the requirement. The communication was very smooth. They listened to everything I had to put forward and they were very complainant to the things. I would advice them to anyone looking for branding their ventures. Thank you Sourabh and Team." We are one of the best logo design companies offering professional logo creation services to multiple arenas comprising of Travel, Fashion, Medical, Technical, Clothing, Gaming, Dental, Real Estate, Food and many more industries. We work with a team of pro creators who introduce captivating corporate graphic elements for your website to build your brand’s online identity. Logo is one among the crucial aspects of business marketing. We believe that a well-designed logo is a significant part of overall marketing strategy of a company. The group of graphic designers and logo makers at Verve Logic provide customized development at cheap price to develop an influential identity with one among the highest satisfaction in the market. We are the efficient builders to help you out with ideas to grab right customers for your business. 1200+ exquisite logos till date. Fill out the form below and we'll contact you very shortly.